Our products are sold under the protected brand Clean Air Optima®. In addition, the brand stands for the main objective of Clean Air Optima: to enable the best air quality in all interiors where people stay. Our range includes air purifiers, air humidifiers, air washers, dehumidifiers, HYBRID units for simultaneous humidification & air purification or dehumidification & air purification, fans and models suitable for aromatherapy. Clean Air Optima Germany GmbH is a subsidiary of Clean Air Optima International BV with headquarters in Hengelo / NL and is specialist for air treatment systems in rooms up to 100m². The Clean Air Optima Group ensures its existence through the Satisfaction of its customers. The stated goal is highest Customer satisfaction. Clean Air Optima® products are Certified according to their intended purpose. And for this we constantly monitor the quality of the product, analyze customer problems and recommend appropriate solutions. We offer our customers a high quality customer service: they receive expert advice before and after purchasing our products. Clean Air Optima International BV in the Netherlands is represented by a subsidiary in Germany. Deliveries to our customers in Germany, Austria, Switserland and in the rest of Europe/World, have since been handled by Clean Air Optima Germany GmbH in 48529 Nordhorn. 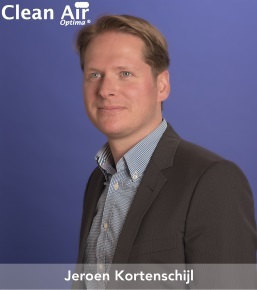 With two competent managing directors, Jeroen Kortenschijl and his twin brother Frank Kortenschijl, both of whom have been working in the industry for many years, our customers receive the best possible advice, support and supply of Clean Air Optima® products. Studies show that people spend 90% of their time in closed rooms. Recent studies, by leading Environmental protection organizations, show that our indoor air in living and working areas is sometimes much more polluted than the outside air, due to biological and chemical pollutants. The room climate is determined by temperature, humidity, air quality and air movement. The humidity is often crucial for an ideal indoor climate. Humidity in homes or buildings can cause health problems to people. Too dry air can also have negative effects on health.